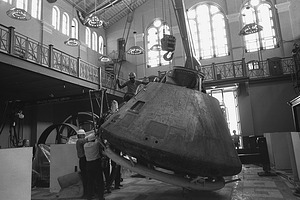 The north hall displaying "famous firsts" in aviation and space flight history in the Arts and Industries Building is scheduled to close on September 1 so that the building may be renovated for the Bicentennial of the American Revolution exhibit. This hall was the last section of the A&I Building still open to the public. 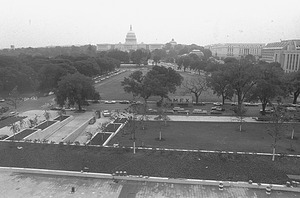 The National Cultural Center is established by the U.S. Congress as Public Law 85-874. The Smithsonian is given responsibility for overseeing its initial planning. As directed in the act, the center will present classical and contemporary music, opera, drama, dance and poetry; present lectures; develop programs for children and the elderly; and provide facilities for other civic activities at the center. In January 1964, it will be renamed the John F. Kennedy Center for the Performing Arts. The Charles Willson Peale Papers project is established under a grant from the National Endowment for the Humanities. Lillian B. Miller, Historian of American Culture at the National Portrait Gallery, is appointed editor. F.L. 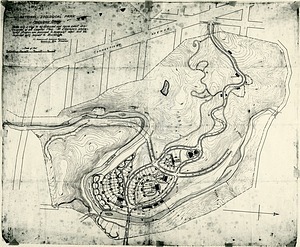 Olmsted & Co., Landscape Architects, Brookline, Massachusetts, submits a preliminary study of Rock Creek Park for the National Zoological Park. The plan shows a central developed plateau where most of the buildings are grouped. A winding carriage path leads through the Park to and from this area, with scattered exhibits visible from the pathway. 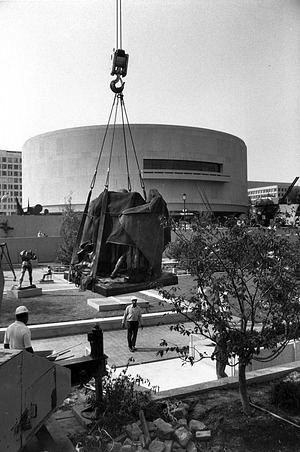 The National Museum of American History closes for renovation. 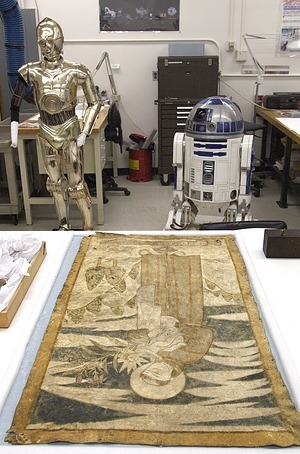 However, its most popular and iconic objects, including C-3PO and R2-D2 from the movie Star Wars, will be available for visitors to view in temporary exhibits across the Institution. President Dwight D. Eisenhower signs Public Law 85-935 authorizing the preparation of plans for the construction of a building for a National Air Museum to be located on the site bounded by Fourth and Seventh Streets, Independence Avenue, and Jefferson Drive, SW.
A new veterinary hospital opens at the National Zoological Park, providing state-of-the-art medical and surgical care for the animals. 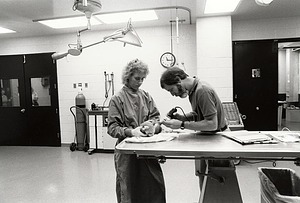 It houses the Zoo's Department of Animal Health and Department of Animal Pathology. 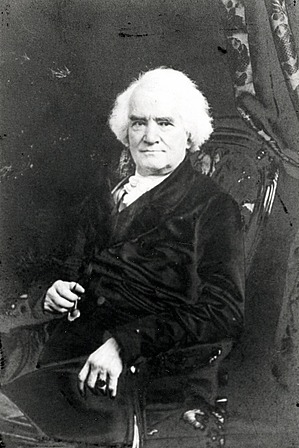 On September 8, 1846, Vice President George M. Dallas is elected the first Chancellor of the Smithsonian Board of Regents. He became a member of the Board of Regents ex officio on 10 August 1846 when the Institution was created. 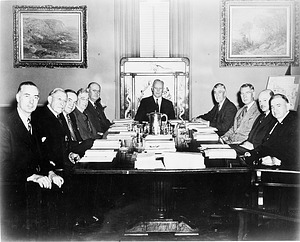 The first meeting of the fifteen-member Smithsonian Board of Regents is concluded on September 9, 1846. Members of the board include: the Vice President of the United States, Chief Justice, and the Mayor of the City of Washington, all ex officio members; three members each of the U.S. Senate and House; and six citizen members. Four committees are established, an Executive Committee, a committee to prepare a plan to carry out the provisions of the Act of Organization, a committee to investigate formation of a library, and a Building Committee. The newly renovated Orkin Insect Zoo opens in the National Museum of Natural History. With this renovation one of the museum's most popular attractions is expanded with an entirely new exhibition. The Insect Zoo, a collaboration between public programs staff and museum entomologists, features a large variety of live insects and many hands-on activities to encourage visitors of all ages to learn more about our diverse natural environment. The Smithsonian Institution returns human remains from the collection of the National Museum of Natural History to a delegation of the Blackfeet Tribe of Montana. A small ceremony was held outside near the Constitution Avenue entrance, and a peace pipe was passed. The television series Smithsonian World wins an Emmy for Outstanding Informational Series at the Emmy Awards. Executive producer Adrian Malone and SI television consultant Tom Wolf accept the award. 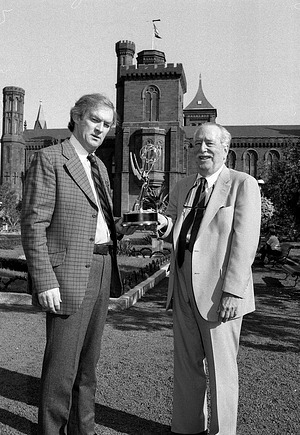 Smithsonian World also won an Emmy in 1985 for Outstanding Informational, Cultural or Historical Programming. The first Komodo dragon ever born outside its native Indonesia is hatched at George Mason University on September 13, 1992. The egg was laid 237 days earlier at the National Zoological Park. 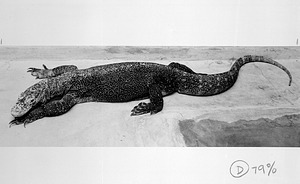 Within four weeks, a total of 13 Komodo dragons hatched at George Mason and at the Zoo, comprising the largest hatching of Komodo dragons on record, in zoos or in the wild. 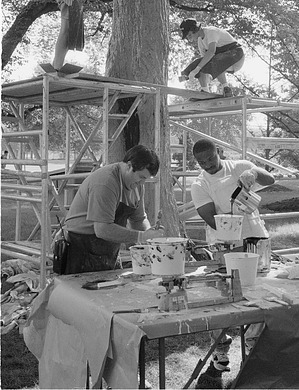 The Hirshhorn Museum officially reopens its Sculpture Garden after renovation to provide access for disabled visitors. The redesign is accomplished by Lester Collins, a Washington-based landscape architect, and includes graded ramps along the north border of the garden to give disabled visitors access to the major viewing level. A third ramp is built to provide access to the lower level, and pathways are resurfaced in brick to make it wheelchair accessible. The Anacostia Neighborhood Museum opens in Anacostia, a primarily African American neighborhood in southeast Washington, with a celebration including an 84-piece band. This museum, an "experimental community museum," which is located in a renovated theater, is operated in cooperation with the local community. Its first six exhibits include: a Mercury space capsule; a reproduction of an 1890 Anacostia store; a little theater; shoebox collections on many natural-science subjects; skeletons that could be disassembled; and a small zoo. 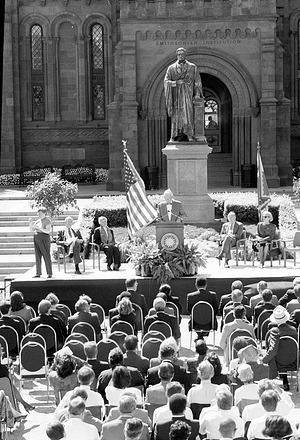 To commemorate the 200th anniversary of the birth of James Smithson, the founding donor of the Smithsonian Institution, Secretary S. Dillon Ripley organizes a three day symposium with scholars from around the world. 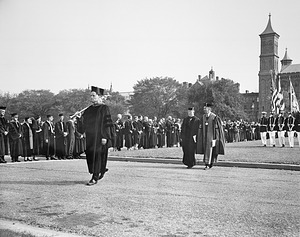 The event includes an academic procession, addresses by Chief Justice Earl Warren and Thomas Boylston Adams, concerts and a parade by the U.S. Marine Corps, a banquet, presentation of the Hodgkins Medal and Smithson Medal, and lectures by distinguished scholars. The grand opening of the new National Air and Space Museum Restaurant is celebrated with a ribbon-cutting, an enormous cake made in the shape of the restaurant, prizes, and a food trivia quiz. The architectural firm of Hellmuth, Obata, and Kassabaum, which designed the museum, developed the design. 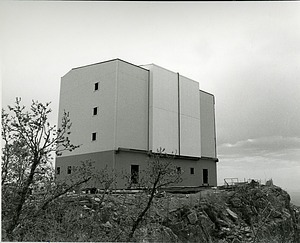 Construction on the addition to the museum, which seats 960, began in March of 1987. 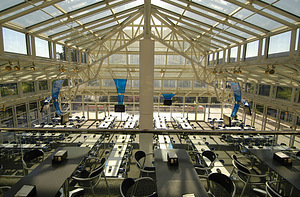 The facility included a self-service cafeteria, "Flight Line," and a full-service dining room, "Wright Place." 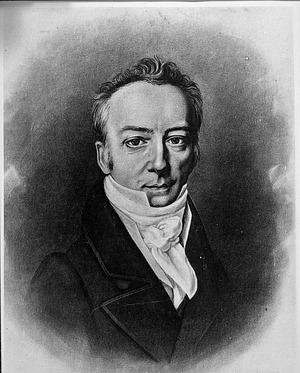 Returning from a sojourn on the Continent, in early August 1807, James Smithson is taken as a prisoner of war in Tonningen, at the moment of the rupture between England and Denmark in the Napoleonic Wars. He subsequently arranges a transfer to Hamburg, Germany, where he is again held under arrest, this time by the French. On September 18, 1808, Smithson writes to Sir Joseph Banks, president of the Royal Society of London from 1778 to 1820, noting that he is physically ill, and requesting Banks use his influence to get Smithson back to England, which Banks does. 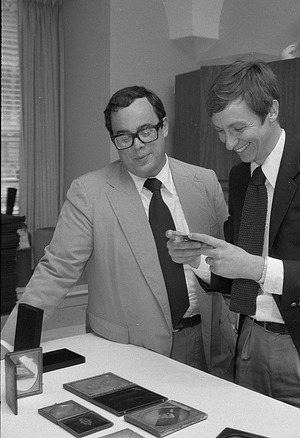 I. Michael Heyman becomes the tenth Secretary of the Smithsonian Institution in September. 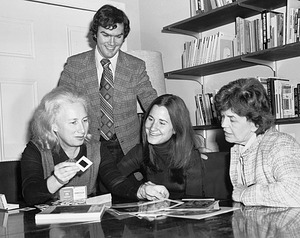 An environmental lawyer, Heyman was Chancellor of the University of California at Berkeley. The permanent exhibition How Things Fly opens at the National Air and Space Museum. 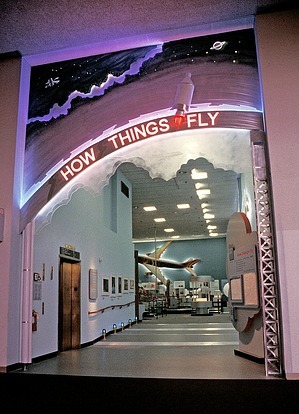 The exhibition offers numerous hands-on exhibits which teach visitors how things fly. The flexible design will allow changes in the exhibit once testing is done on displays to find out what works and what does not work with visitors. The National Portrait Gallery opens its first research exhibition in photography, entitled Facing the Light: Historic American Portrait Daguerreotypes. A gift of $200,000 is received from Thomas George Hodgkins of Setauket, New York, to be used, in part, for studies of the atmosphere in relation to human health. 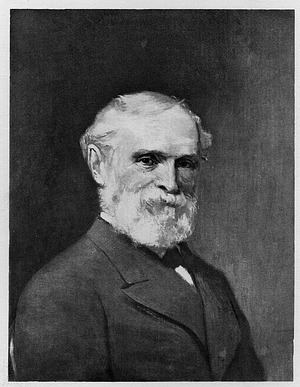 At Mr. Hodgkins death in November 1892, additional gifts are left by will to the Smithsonian. On October 25, 1893, the bequest of $42,000 in West Shore Railroad bonds is received. 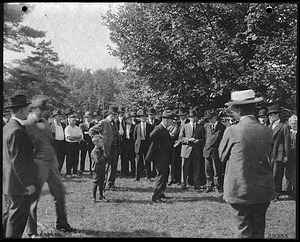 In May 1894, an additional $8,000 is received. At the groundbreaking for the Freer Gallery of Art, Acting Secretary Richard Rathbun gives a brief address and turns the first shovel full of earth to start the construction of the new Museum. As a grand finale to the National Forum on BioDiversity, which was sponsored by the Smithsonian Institution and the National Academy of Sciences, the Smithsonian’s Office of Telecommunications airs a two-hour national teleconference via the Westar IV satellite. Thousands of people across the country participate by asking questions and listening in on the discussions of expert panelists. 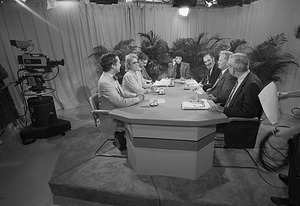 The telecast is broadcast live from a studio at The George Washington University. The Smithsonian Centennial Exhibit closes at the U.S. National Museum. 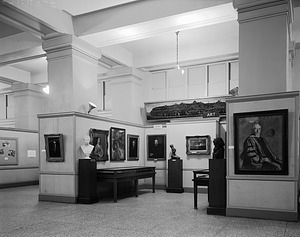 The exhibit, which opened August 10, 1946, is located in the lower level of the north hall of the Museum. The exhibit includes about fifty objects honoring those who contributed to the National Collections. 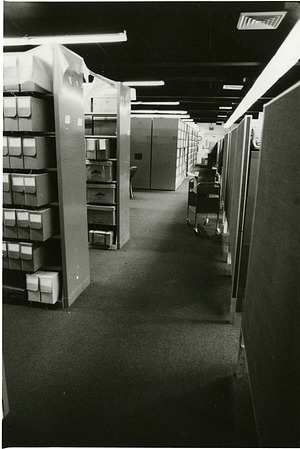 The Smithsonian Institution Archives assumes responsibility for archival resources throughout the Institution. The Preliminary Guide to the Smithsonian Archives appears in September in conjunction with the Smithsonian's 125th anniversary. The Victorian Garden, in the South Yard to the west of the Arts and Industries Building, opens. It is the work of the Office of Horticulture, and is the Smithsonian's first major horticultural display. 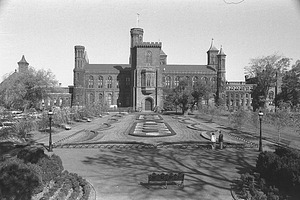 The Quadrangle, the Smithsonian's underground museum, research, and education complex opens. 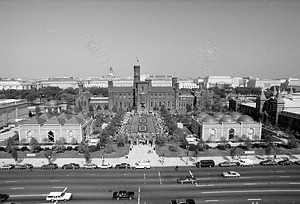 It consists of two major museums -- the Arthur M. Sackler Gallery (a museum of Asian art) and the National Museum of African Art -- as well as the S. Dillon Ripley Center, and is home to the Smithsonian Institution Traveling Exhibition Service, the International Center, and the National and Resident Associate Programs. 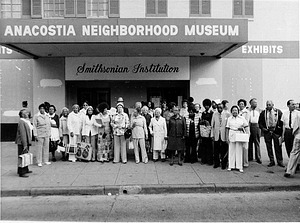 Washington, D.C., Mayor Marion Barry proclaims September 28, "Smithsonian Institution Day." In a special ceremony held at the 7600-foot level of Mt. 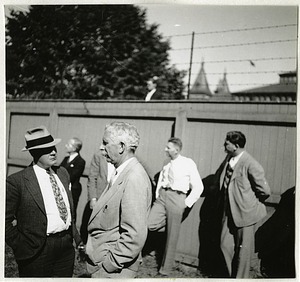 Hopkins, the Smithsonian Astrophysical Observatory officially dedicates its new 60-inch reflecting telescope to the memory of the late Carlton W. Tillinghast, Jr.
Smithsonian Secretary and astrophysicist Charles G. Abbot tests a solar radiation steam boiler of his design. The National Broadcasting Company films the test and a short program is broadcast by solar power. The solar radiation steam boiler exposes thirty-six square feet of mirror surface, and it is intended to produce about one half horsepower at the engine. The device has many defects and is too large to be practical for generating solar power. After the test a smaller solar flash boiler is prepared and offers greater promise.